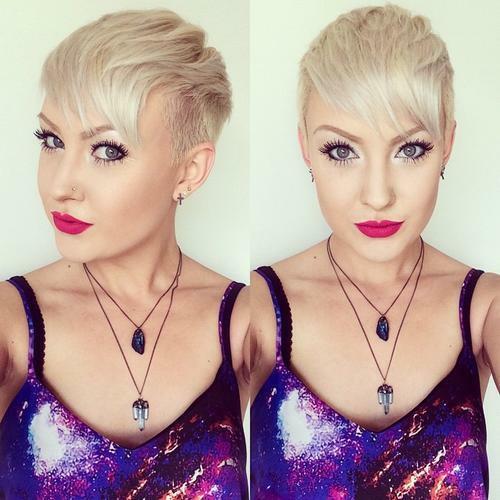 The pixie haircut is a classic cut which has been proven time and time again to be incredibly versatile. 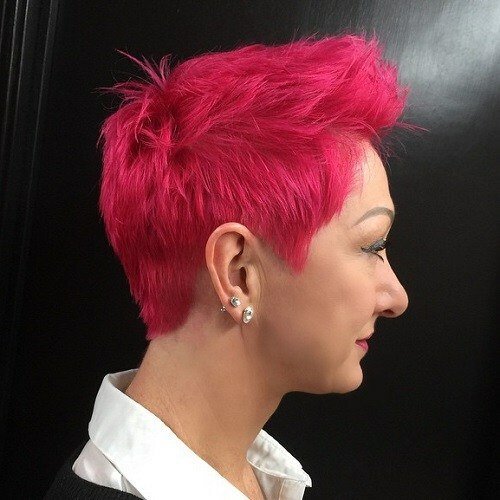 Not only does this impish, cropped hairstyle suit every hair texture and every face shape, the pixie can also be as dressed up or as dressed down as you like, depending on how you wear it. It’s hard to believe now that the pixie was once frowned upon for being far too masculine for women to wear. Although the pixie can be a tomboyish look, suitable for rock chicks and gorgeous gamines, it can also be styled to look utterly feminine. You’ve seen it rocked on the red carpets and on the runways, so why not take the plunge and opt for a pixie crop yourself? Here are 22 of the most colorful, exciting designs. 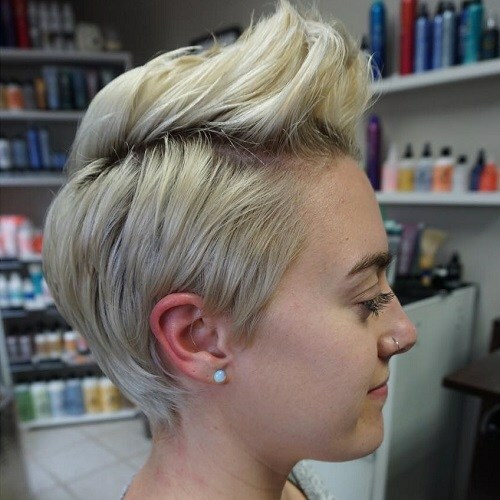 The icy tones in this extremely short haircut will allow your beautiful features to stand out. The layered bangs are pushed forward in a style that adds edgy structure to the hair and makes the model’s eyes pop even more. Whether it’s a skirt, a pair of earrings or a pixie haircut, the asymmetrical trend is everywhere right now. 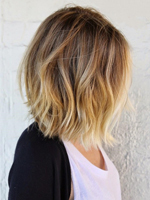 Keep one side super short but balance it out with long wavy bangs in a warm, chestnut color like this. It’s impossible to say what we love most about this flattering hairstyle; the shimmering golden color or the expertly cut pixie. 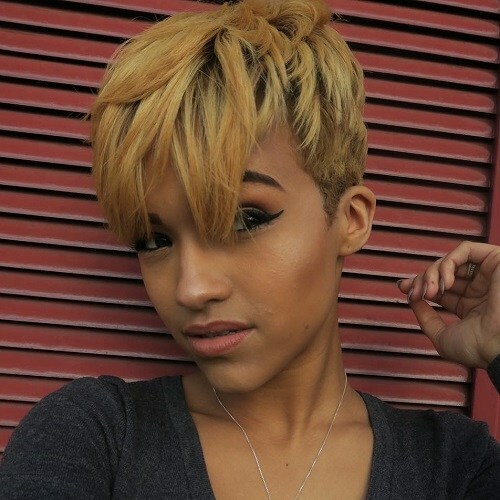 The soft blonde tones look particularly flattering on girls with gorgeous, caramel skin tones and the swooping, long bangs add even more character. Multi-colored hair is all the rage right now. 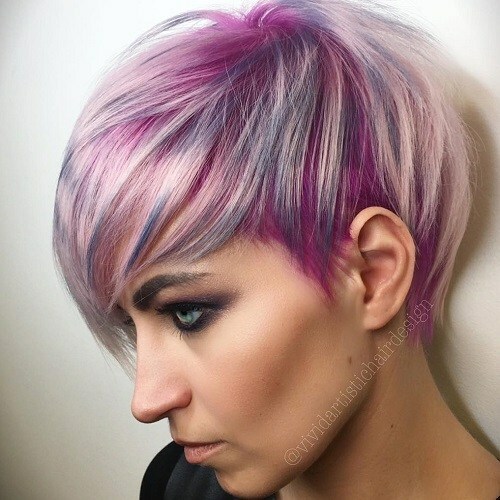 The vibrant shades of purple, lilac and blue in this pixie crop blend absolutely beautifully together. 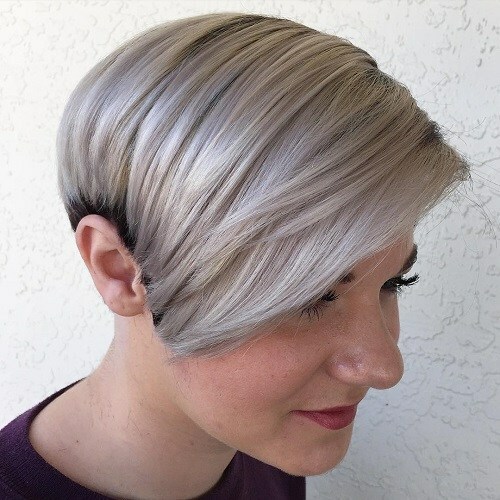 Vibrant colors on a choppy pixie can be at risk of looking slightly clownish, which is why the muted pastel hues look so subtle and sophisticated. If you’re going for an edgy look like this super layered pixie crop, why not go all-out rock chick with white blonde and subtle dark roots? This is an extremely textured cut which will look particularly good on fine haired girls who want to add depth and dimension to their look. This striking haircut looks totally dramatic thanks to the juxtaposition between the long front section and the super short back. 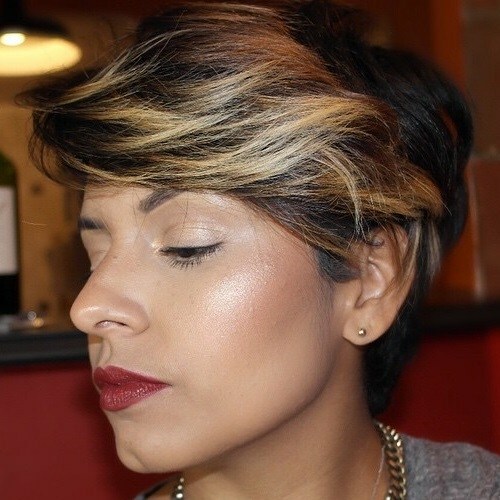 If you can’t decide between a closely cropped pixie and a face-framing bob, this ash brown mixture is ideal for you. Tired of blending in to the background? This vibrantly colored crop is a guaranteed way to stand out in any crowd. Darken the roots of an icy toned hair color, like this pale purple tone, and you’ll find that your hair looks instantly fuller and thicker. 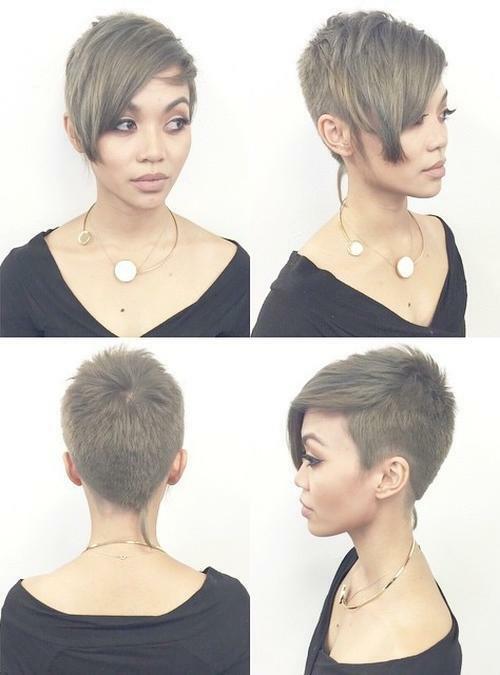 The edgy pixie with long layers and shaved undercut make this style look even better. Take a walk on the wild side by adding some gold and brown ombre to your full, textured bangs. This coloring brightens up a hairstyle that could otherwise be in danger of blending into the background. 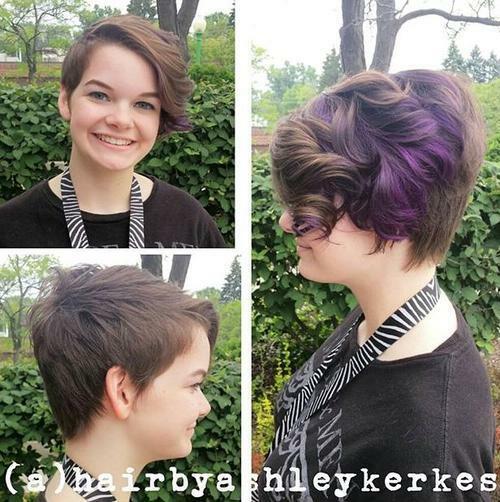 The subtle tones of deep blue and purplish red in the bangs of this edgy pixie look almost too beautiful to be true. 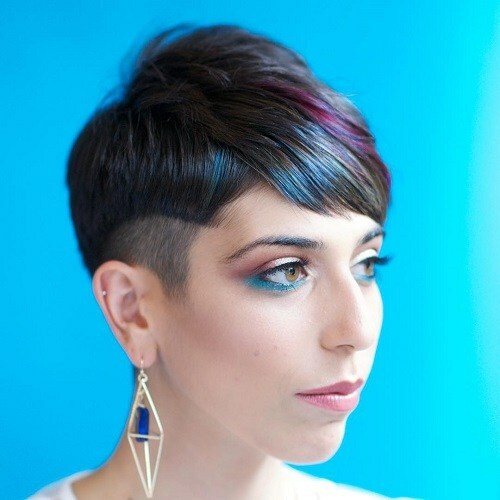 Try out this style, complete with the cutting edge undercut, if you fancy trying something different. This hairstyle is all the evidence we need that you can rock bold, vibrant colors and still look completely sophisticated. The flattering haircut with sweeping bangs looks amazing and the pop of color looks even better. 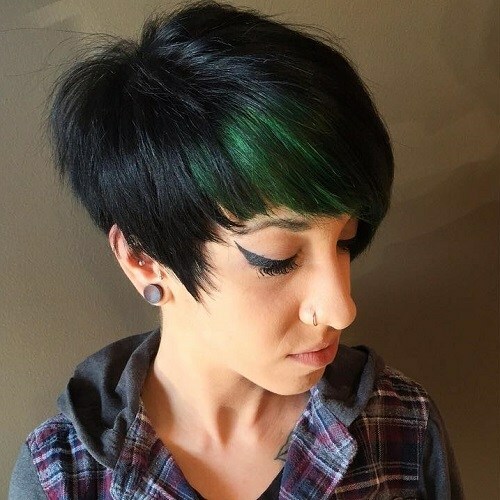 One sure fire way to liven up a jet black pixie is to add flashes of a bold color, like this emerald green, into the fringe. 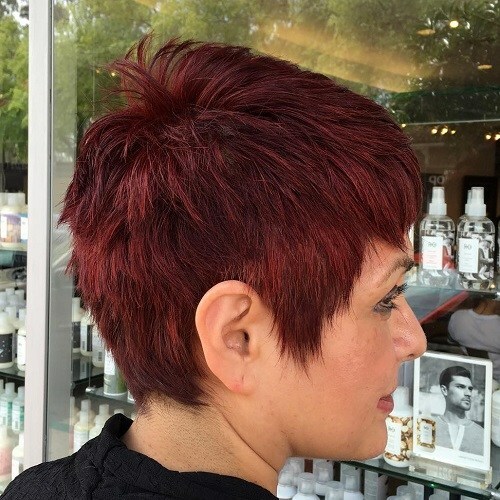 Burgundy red pixie crops look gorgeous on every face shape and every skin tone. This is just the right amount of rock chick, especially with such a choppy, youthful cut. The only thing that could possibly improve upon a jagged, cool pixie crop is a pastel color scheme. 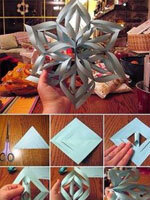 The icy blue and silver hues add an almost futuristic edge to this trendy style. 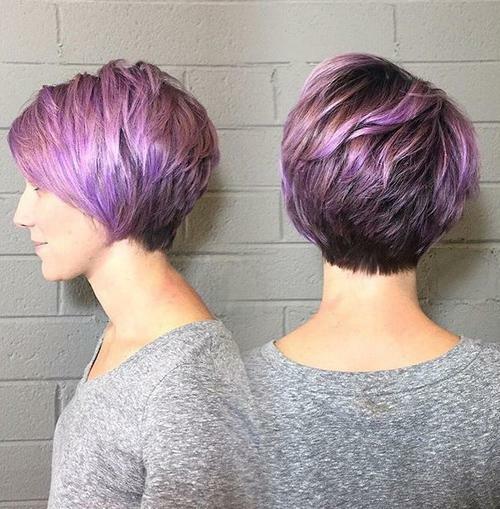 Multi-tonal purple shades add a totally on-trend depth to this sleek pixie cut. 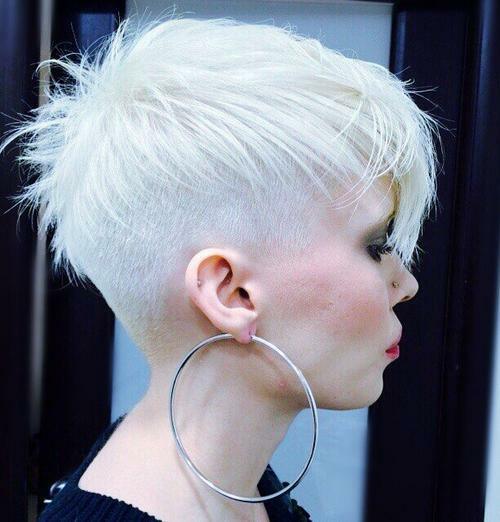 Make this jaw-droppingly platinum blonde pixie cut your signature style. The blonde will leave you looking and feeling like a blonde bombshell, especially if worn with red lipstick, and the cut is punky and cool. 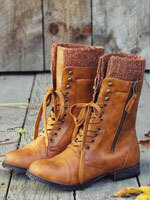 Only dare to wear your hair in this high fashion style if you don’t mind taking on the role of an edgy trendsetter. 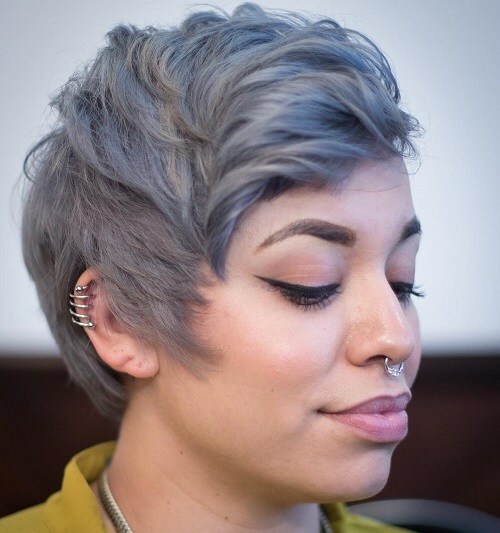 Keep the layers long and a cool shade of pastel blue, while the roots and shaved side are dark brown. 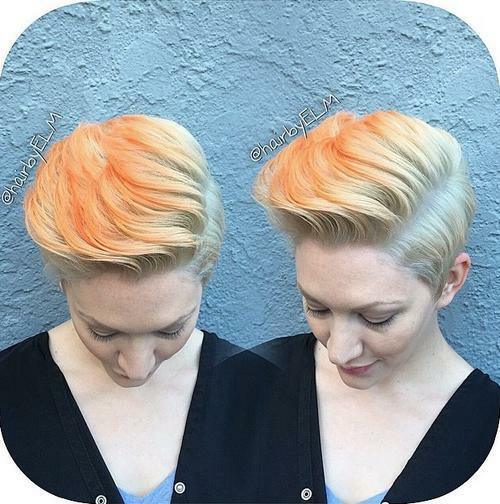 Here is another way to rock pastel tones in your pixie. The faded orange ombre in the ends of this hair, together with the ‘ice cream style’ sweep, makes this hairstyle look more soft and girly. 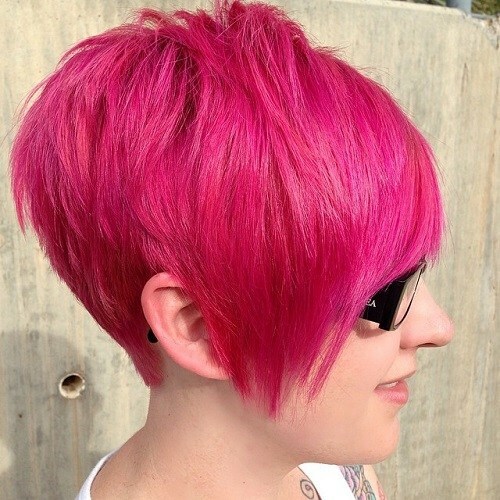 If pastel hues aren’t for you, why not go all out with a vivid, bold shade like this beautiful pink? As if the color wasn’t eye-catching enough, the cut is totally flattering with long layers around the bangs and a short, stacked back. 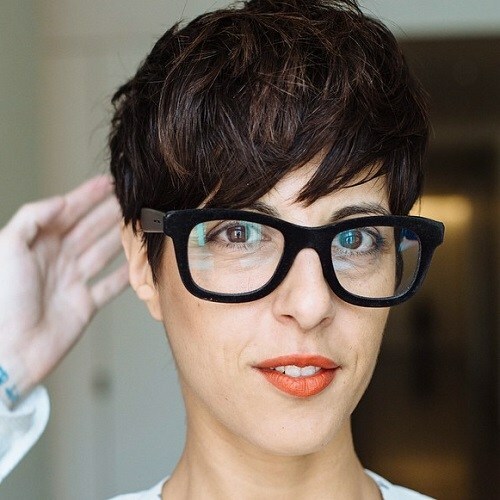 When you go for the chop and get the pixie cut you’ve been dreaming of, you’ll be amazed by just how much you can play around and experiment with such a short style. This extreme, flipped up fringe is just one example of the many fun looks you can wear. 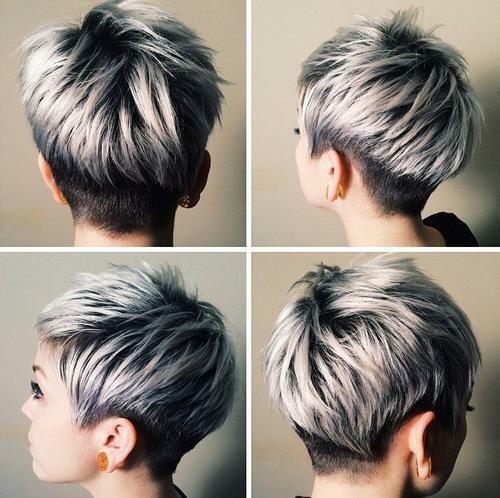 It’s no secret that silver hair is all the rage right now. Try out this daring shade as subtle highlights in blonde hair and you’ll love the chic results. 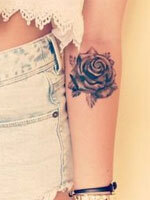 It looks particularly good when paired with a sleek and polished pixie like this one. 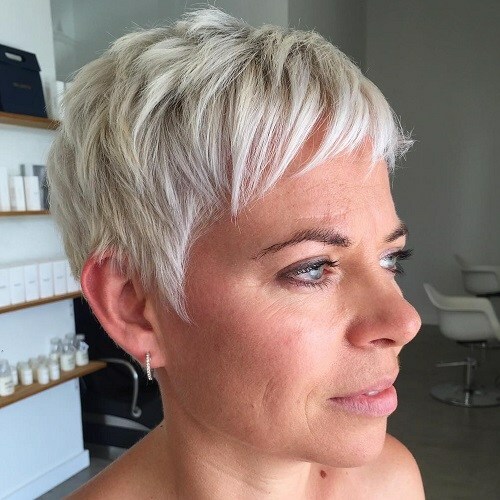 Make your pixie cut look youthful and fun by having your stylist cut lots of choppy layers into multi-tonal brunette hair. Sweep the hair forward to frame your facial features.